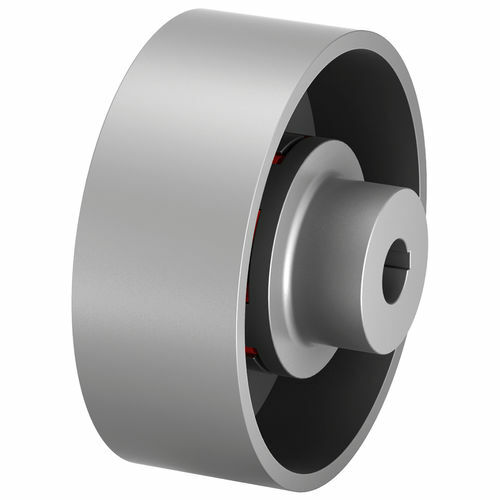 The TSCHAN®-S S-BT coupling is a torsionally flexible, puncture proof claw coupling with brake drum or brake disk. It compensates for angular, radial and axial shaft misalignments within defined limits. The coupling transmits torque through elastic buffers loaded in shear. These buffers come in Perbunan (Pb) or polyurethane (Vk), as a standard VkR, and are connected to each other to form an elastic buffer ring. This buffer ring dampens shocks and torsional vibrations and is resistant to oil. Buffer rings made of Perbunan are electrically conductive. The coupling is suitable for use in every direction of rotation and installation position.